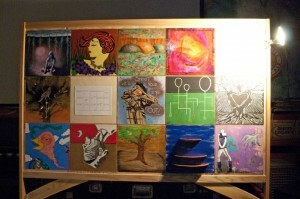 Over a dozen local artists contributed to a collaborative art piece composed around the idea of ‘The Underground Garden’. 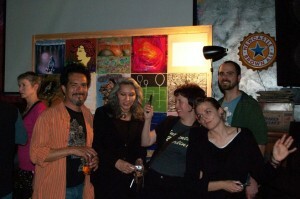 The piece was unveiled at the CD Release Party at Audie’s Olympic/Club Fred on the night of Saturday, April 24th. wood-working blogger Adam Wall built the individual wood tiles (which serve as the piece’s ‘canvases’) and the frame that joins the works together. He is also one of the contributing artsts. The artists currently represented on this project are: Shannon Johnson, Aileen Imperatrice, Ross & Kim Garcia, MyCow, Monica Geigle, David Gomez, CR810 Geigle, Abolino Bautista, Donnalee Dunn, Jamie Meadows, Ole’ Scovill, Ed Stewart and Adam Wall.